This recipe is a real yummy one - I think it might actually be my husband's favourite! It came about whilst making flapjacks - I waaas making flapjacks, but then decided to use it for a crust instead. Haha! 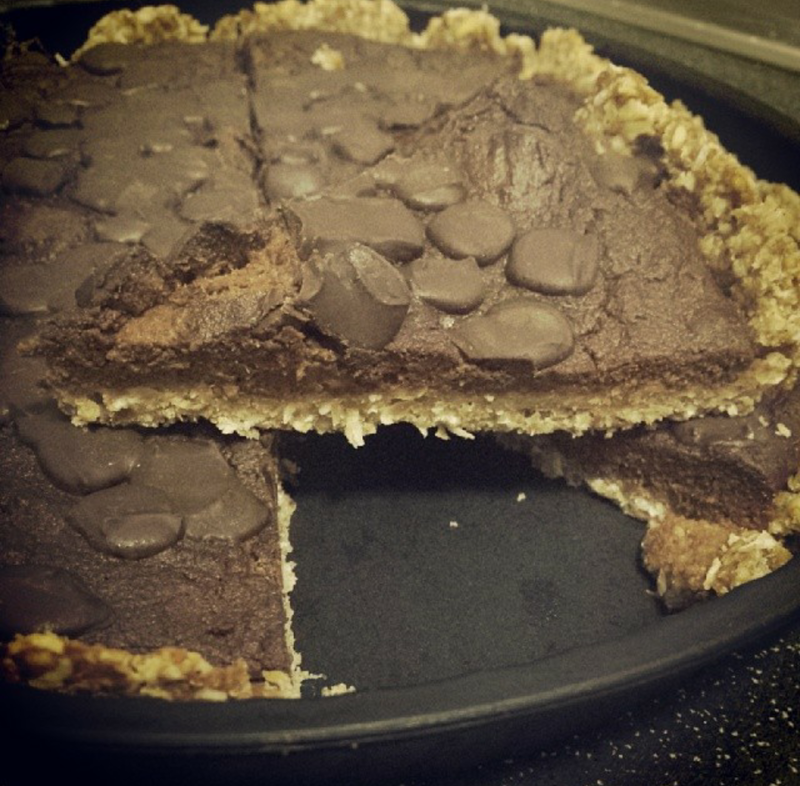 This chocolate tart is super simple, nutritious and really yummy and chocolatey! Mmmmmm. It took about 30 minutes total to prepare and bake it I reckon.. and I've made it with less AND more dark chocolate than 50g before, and it's JUST as good everytime. 1. Chop, peel and steam sweet potato until soft enough to mash. 2. Preheat the oven to gas mark 6. 3. Soak dates in a bowl for about ten minutes or so. 4. Put oats and desiccated coconut in a separate bowl with a pinch of salt. 5. Mash the banana, dates and peanut butter together. 6. Bind the peanut butter and banana mixture and oats together with your hands. 7. Press the 'flapjack' mix into the chosen baking tray or silicone mould. 8. Place two squares of dark chocolate on the crust and place it in the oven for 2-3 minutes to melt the chocolate. 9. Take the back of a spoon and spread the chocolate around, now set the crust base aside. 10. Crack an egg in the food processor and blend until slightly frothy. 11. Add the vanilla essence, the rest of the dates, and the cooked sweet potato and blend until fairly smooth. 12. Add the cinnamon and cocoa powder, along with the dark chocolate - it will more or less melt because the sweet potato is still warm, blend until combined. 13. Add the baking powder and blend until combined. 14. Spoon the chocolate mixture on to the crust base, and place in the oven for 7-9 minutes - it should still be soft when you take it out, but it will set and harden in the fridge. 15. Allow to cool and enjoy.